Slip and fall attorneys see a lot of personal injury claims that could have been avoided if building owners had been more dutiful. Most slip and fall injuries are caused by negligence by the owner or operator of a public or private space. If you’re aware of these common causes of indoor slip and fall injuries, you may be able to avoid personal injury. One of the most common reasons that people seek a slip and fall lawyer is for a personal injury that occurred as a result of slipping on a wet floor. If a floor has just been mopped, waxed, or if something has been spilled on it, a business is required to put up a cautionary sign or barrier. When a business owner or employee fails to put up a sign, or uses too much or an inappropriate type of wax or cleaners on a floor, they’re liable for any personal injury claims or slip and fall accidents that occur as a result. Another common cause of a slip and fall accident is carpeting that is worn, damaged, frayed, ripped, bulging, or has holes. Damaged carpeting is a huge liability if a slip and fall injury occurs. Staircases can be dangerous even when they are in perfect condition, and many things can make a staircase even more dangerous. A slip and fall accident can occur if a staircase has poor lighting, a missing or damaged handrail, is too steep or the steps are too far apart, or the steps are broken, damaged, or worn down. 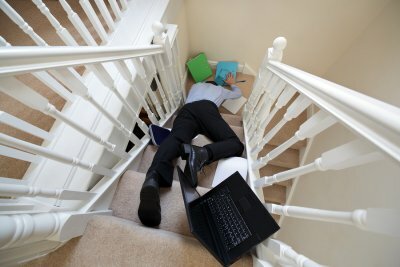 Debris, obstacles, and spills on staircases can also cause a slip and fall. Property owners are legally required to properly maintain elevators and escalators to ensure passenger safety. A slip and fall accident can occur if an elevator or escalator isn’t operating correctly and stops or jerks suddenly, resulting in a fall. Body parts, clothing, or footwear can also get caught in the machinery and cause injury.